Pretty nail polishes always make my heart skip a beat. What could be a better day than a so-called Mani-Monday to check out a-england's last collection. I have presented you Burne-Jones Dream Collection back in June 2013. A-england doesn't bring out many collections but when they do, all the shades have very good quality. I really appreciate this more than pushing collections all the time with less quality or inspiration. That said I haven't reviewed a-england's Ballerina Collection which was released right after Burne-Jones but they all appeared almost the same on my fingers, so ended up not being very convinced of that one. Now back to Elizabeth & Mary Collection, which is just released... This one is my absolute favorite of a-england within the last collections they released. Just keep on reading to see ho pretty these are. 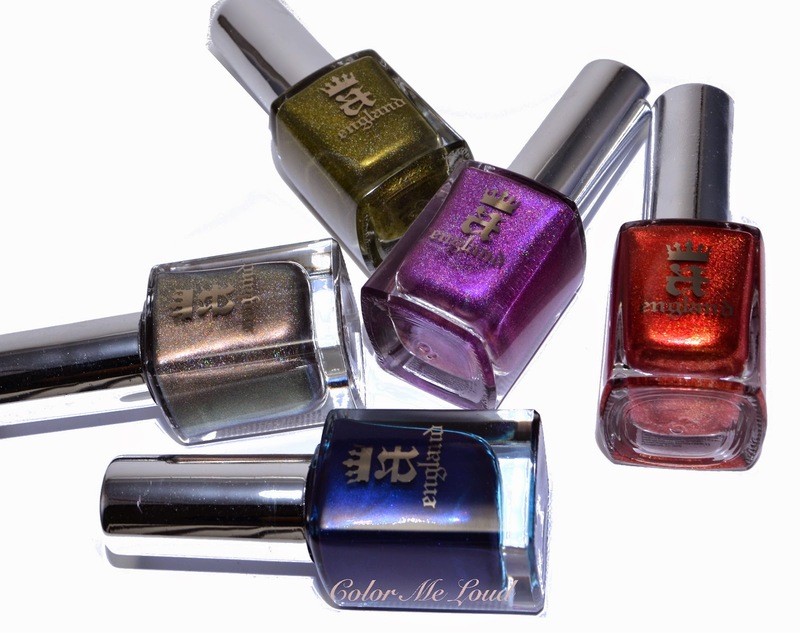 Fotheringhay Castle is a mid-toned olive green nail polish with metallic holographic finish. It has great finish, almost a one-coater like many other a-england polishes. The holographic effect is strong, especially under the direct sun light. The consistency is very good, it is self leveling and I don't see any brush strokes after the application. Virgin Queen is one of my favorites. It is such a complex chameleon shade which is so difficult to explain. I would call it a deep cool bronze with metallic holographic finish. In reality it is more than that though. It flashes almost all colors over a seriously pretty base. Zoom in this photo and you will see the multi colored shimmer. Loving this one so much. It has great consistency, I applied two coats for this photo but I could get along with one too. Crown of Thristles is a mid-toned warm purple with strong holographic effect. Even under shadow, this looks very pretty but it is when all th shimmer comes to play under the light, it shows its real beauty. I don't have to say this is my absolute favorite of the collection, together with Virgin Mary. You know, I can't say no to purple and when it is so complex and pretty is... so in love. Great consistency, lovely finish, below I am wearing two coats. Oh yes and I am trying these lines with Crown of Thristles on my fingers. Queen of Scots is the only disappointment for me from this collection. It is supposed to be a great dark blue with subtle metallic effect. 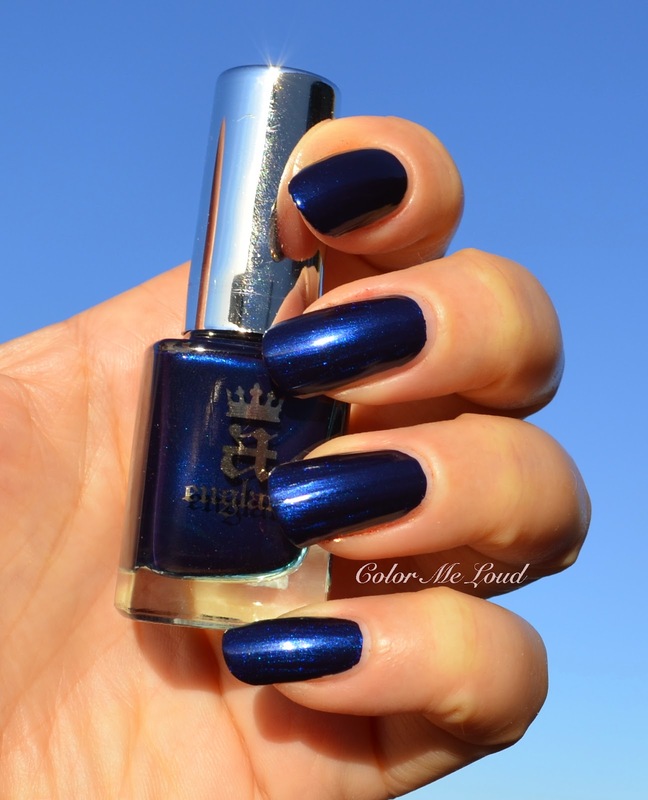 I like dark blues and wear them very often but this shade was a little too ordinary among all the other bling bling, still nice but nothing we haven't see of. And it is important to note that it stains, which is the main reason why it probably never make it on my fingers other than swatching here below because it took me long to remove it. Not recommended. Below I applied two coats. Gloriana is a true stunner. Even for a "rather not have red on the nails" girl like me. Gloriana must be the most stunning and complex red nail polish I own. It has a similar effect to a-england Excalibur (2nd version, reviewed here), with foil metallic finish and two noticeable shades (red and gold in this case) in the shadow (see the second photo below). These both glow like fire under the sun giving a beautiful complex shimmer. Below you can see it in two coats. This one is certainly one of the highlights of the collection. It is not holographic but in my book, it is even better! Final thoughts: Love love love this collection, a-england really nailed it this time. My picks are Virgin Queen, Crown of Thristles and Gloriana. The only one I would't recommend is Queen of Scots which is a little staining. Make sure to snag at least one or two, these are worth it! Availability/Price: You can check the local stores to buy a-england at their website here, under "where to buy". I purchased mine from Lovely Cosmetics but if you are in Germany you can as well go for Pshiit Boutique or Le Doux Nuage from France. It might be less expensive depending on the size of the order. Each of the nail polishes retail around 10€. Which one is your favorite? Have you tried a-england before? 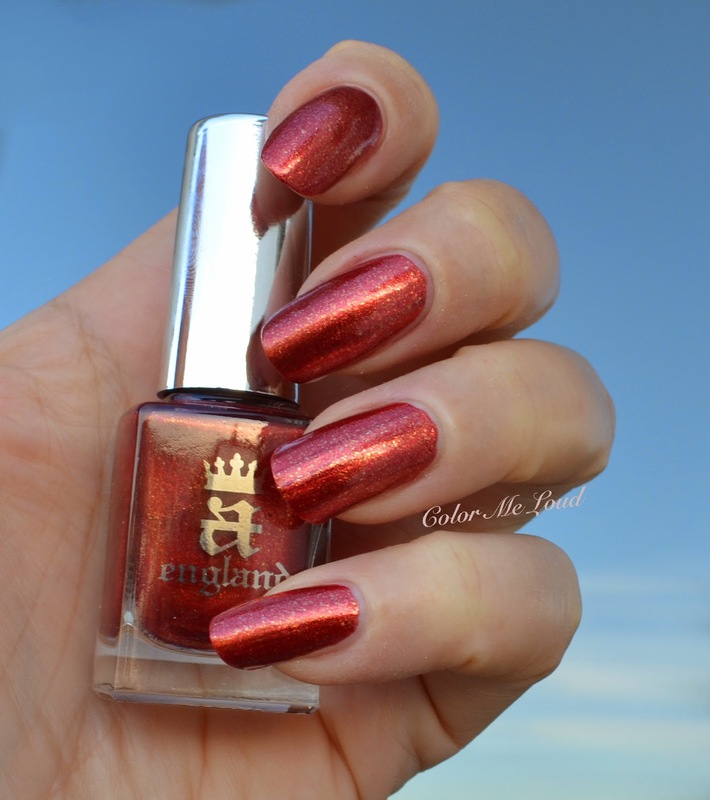 aengland does the pretties holos! I have several nail polishes from them, and my favorite is Beauty Never Fails. Out of these I'm the most interested in Virgin Queen and Fotheringhay Castle. Very tempting! Oh Beauty Never Fails is also a stunner! As I have already told you at Instagram, I was thinking about you when I swatched the shades you mentioned above, they are exactly your colors! Oh no, I think I need every single color! These are all sooooo gorgeous! How is that even possible??? Lovely swatches indeed! I super like the first and third nail colors. I like the color and the finish as well. The ones you selected are gorgeous, even more so in real life, I hope you can get your hands on them and enjoy! Die sehen sooo toll aus! Habe den in Lila zu Hause und liebe die Farbe! 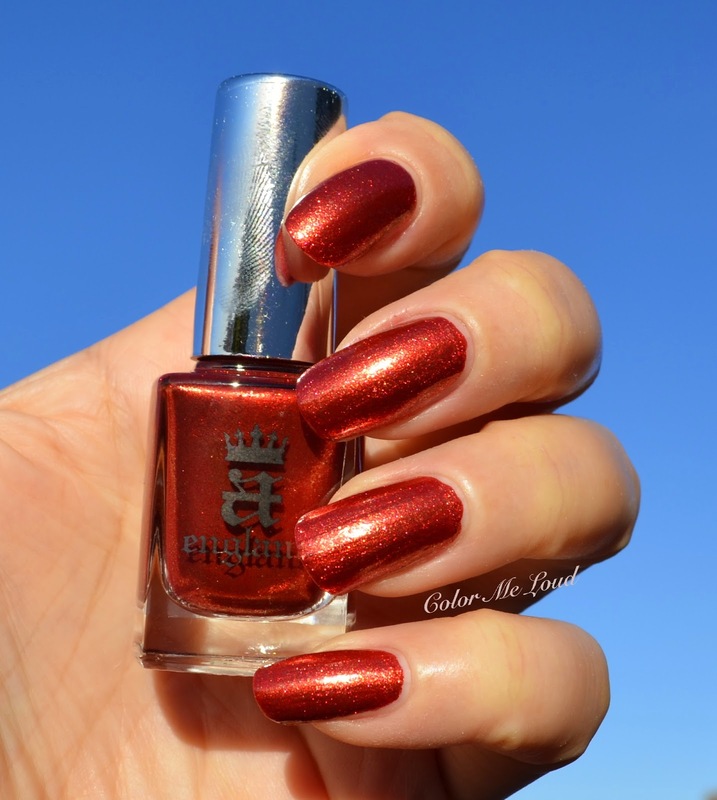 Crown of Thristles ist auch meine Lieblingsfarbe aus diesen Kollektion!